The creators of Promises offer a spry story starring a piglet determined to dance. 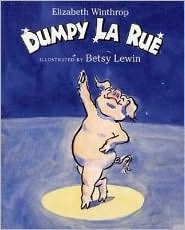 Though his parents insist that "Pigs don't dance./ They grunt, they grovel,/ they snuffle for truffles," Dumpy La Rue "knew what he wanted to do," and kicks up his hooves in front of an audience of barnyard animals. When the sheep announce that they, too, want to dance, Dumpy offers some advice to his pals: "If you want to dance,/ if you want to glide,/ just close your eyes/ and listen inside." Caldecott Honor artist Lewin (Click, Clack, Moo) portrays the closed-eyed assemblage of critters including Dumpy's family spinning, twirling and gliding along with the prancing porker. Her animated pictures, created with black brush lines and watercolor wash, comically capture the animals' initial skepticism and eventual ebullience as they discover the thrill of dancing to their own internal beats. Though the verse intermittently falters in its rhythm and rhyme, the kid-tickling energy and silliness remain constant (e.g., "The goats did a two-step./ The fox did a three./ The mule danced the salsa/ with a neighboring tree"). And amidst the merriment, readers just may pick up on the importance of bucking stereotypes and listening to one's own drummer or whatever it is that is playing "inside." Ages 4-9.